When you choose your bride-to-be’s bachelorette party theme, the simplest way to go is with one of the six notorious bachelorette party plans that have stood the test of time. Many of these ideas are able to be grouped together if your bachelorette’s tastes are more complex but starting with one of these main six models will definitely make bachelorette party planning more relaxed. This entry was posted in Bachelorette Decorations, Bachelorette Games, Bachelorette Party, Bachelorette Party Accessories, Bachelorette Party Favors, Bachelorette Party Planning, Bachelorette Party Supplies, Bachelorette Party Themes, Bridal Shower, Destination Bachelorette Party, Party Planning and tagged bachelorette, bachelorette accessories, bachelorette decorations, bachelorette games, Bachelorette Party, bachelorette party favors, bachelorette party inspiration, bachelorette party supplies, bachelorette party theme, bachelorette planning, bachelorette superstore, destination bachelorette party, lingerie, mother of the bride, mother of the groom, party accessories, party theme on October 28, 2016 by Hype Girl. My name is Eileen and I am part of the Bachelorette Superstore team. I have been married for twenty years and ironically didn’t even have a bachelorette party when I got married. Working here allows me to contribute to each and every one of our customer’s parties! My brother recently married his long time love thanks to Match.com! They had a very low key wedding, which fit them to a tee. Most of the family members had never met and flew in the day before the big event. Working at a bachelorette party store of course made me want to go a little crazy with things. But after a stern talking to from my family, I was forbidden to bring anything suggestive to the event. I wandered around the warehouse for a bit and ended up choosing the Mother of the Bride sash, Mother of the Groom sash and a couple of tiaras. 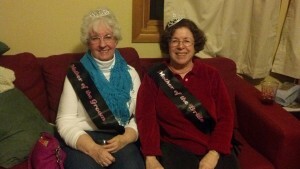 With my brother shaking his head at me, I sashed them up and crowned them with the tiaras. It was actually a lovely moment that honored them for raising great kids. It also broke the ice conversationally as everyone rushed to take pictures. It is one of my new sister-in-law’s favorite photos (shown above)! This entry was posted in Bachelorette Party, Bachelorette Party Favors, Bridal Shower, Party Planning and tagged bachelorette accessories, bachelorette superstore, match.com, mother of the bride, mother of the groom on February 18, 2014 by Hype Girl.